This is an amazing amuse bouche recipe, it is full of great flavors and offers a fresh wholesome element to any food setting. Plus, this Tilapia and Mango Salsa Recipe not only offers taste, but it looks exceptionally sweet served on Lovely Curly Tasting Spoons. 4 inch curly tasting spoons are durable and add just the right characteristics to any type of amuse bouche creation, try them out and experience state-of-the-art dining pleasure. 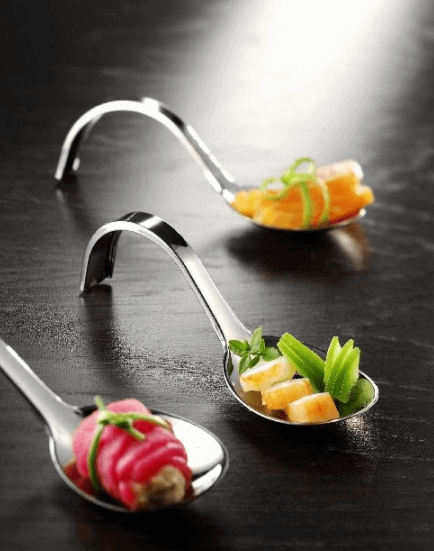 These curly tasting spoons are state of the art appetizer, dessert and amuse bouche spoons. In a mixing bowl, combine mangoes, red bell peppers, lime juice, olive oil, jalapeno pepper, toss these ingredients together until well combined. Now, add salt and pepper to taste. Place bowl in fridge for about 30 minutes so the salsa can chill. Saute your tilapia filets, you can use your favorite fish seasoning to season the filets. Once tilapia is cooked, cut into small bite sized pieces, place a piece of fish on a charming curly tasting spoon, then top with a small scoop of mango salsa and serve.